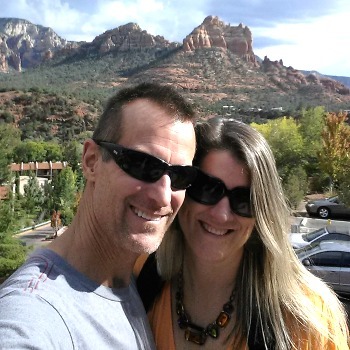 Witness red rock beauty up close with a hike in Sedona. See forest service site for trail maps and descriptions of hiking trails. 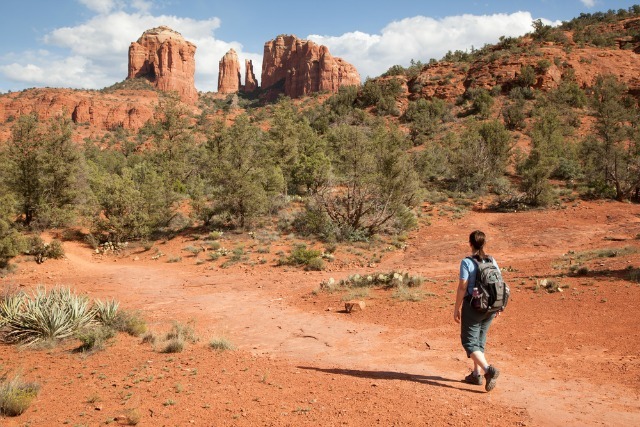 Sedona and the Verde Valley offer some of the most picturesque hikes in the world. There are dozens of options to keep the novice and experienced hiker delighted for many days–trails along rivers, trails on mesas and high up in the mountains, trails in canyons, trails through arroyos, washes and fields, and trails to scenic vistas and archeological heritage sites. Hikes on these trails vary by length and steepness. Trail information and maps are available at Visitors Center. There are also some excellent books on the subject. 1. Choose the hike that is best suited to your fitness level, interest and seasonal appropriateness. When you plan your hike, think of the position of the sun. On hot days you will want to hike early and late in the afternoon. If you do hike during the day, choose trails along creeks and those that provide shade. In the cooler weather, you may prefer to hike mid morning through mid afternoon to take advantage of the sun’s warmth. Although it doesn’t rain or snow often in Sedona and the Verde Valley, when it does, trails can be slippery and sometimes dangerous. Check with forest rangers and/or the Visitors Center for updates on conditions and/or closures. 2. Carry plenty of water. The hiking rule of thumb is to drink a liter of water per hour, but in weather than exceeds 85 F, the need for water intake increases dramatically. Carry more water than you think you will need. It is easy to become dehydrated very quickly without realizing it is happening.. Signs of dehydration include headaches, fatigue and nausea. Drinking small sips of water throughout the day is a good way to stay hydrated. Some hikers find that pliable water bottles with tube extensions, called bladder bags, fit nicely into daypacks, and offer hikers the opportunity to sip whenever they feel thirsty while keeping their hands free. 3. Bring a snack for fuel. Sports bars, sandwiches, dried fruits, jerky and trail mix are some popular foods for taking on the trails to snack along the way for energy. 4. Protect yourself from the sun. Wear hats with broad brims, sunglasses, sun screen and long-sleeved clothing. Consider wearing layers to modulate your body temperature. If you hike early in the morning, the weather will get much warmer by mid-day. If you hike late in the afternoon, be prepared for a significant temperature dip when the sun goes down. Wear comfortable, broken-in boots or hiking shoes that will protect your feet from heated surfaces and loose, sharp rocks. A slip-free sole is a must! 5. Know and tell where you are going. Study the trail before you head out. Bring a map so you can keep track of where you are going. Keep landmarks in sight. Bring a fully charged cell phone and a first-aid kit. Be sure to tell someone where you are going and when you plan to return. Should you get lost or run into trouble, this will speed rescue efforts. 6. Consider bringing a walking stick to help with your balance and to relieve stress on your knees and joints. A staff can also alert wildlife that you are on the way. Although rattlesnakes do not often show themselves, they do live in the desert, especially in dense brush or rocky areas. So be mindful where you put your hands and feet. 7. Follow trail etiquette. Stay on the trails. The area’s cryptobiotic crust is very delicate. Pack out all trash, including garbage and toilet paper.Bury human waste at least six inches deep and 100 feet from any water source. 8. Leave what you find. Make it possible for others to share your sense of discovery: Leave rocks, plants, animals, archeological artifacts and other objects where you find them. A Red Rock Pass (or Golden Eagle, Golden Age or Golden Access) is required when recreating (hiking, biking, swimming etc.) on national forest land in Red Rock Country. The pass must be displayed in the windshield when you park at a trailhead; otherwise you may receive a citation. A pass is not required if you stop to take a photograph or to enjoy a scenic vista for a few minutes. These passes can be purchased at the Sedona Chamber of Commerce, many commercial vendors and machines throughout the area. The cost is nominal: $5 per day; $15 per week; $20 per year.